When I first envisioned The Sketchnote Skill Builder, I saw a small book with about 15 activities. After some brainstorming, some drawing, and the completion of the first activity for the book, I thought I was close to being able to bust out the rest and get it out into the world. But something didn’t quite feel right about it. The idea of a small book with 15 activities to build your sketchnoting skills seemed useful, but I didn’t think it would have the impact that I wanted it to. My goal with this book is to provide not just a few exercises for you to build skills, but a broader approach to the development of this useful skill. 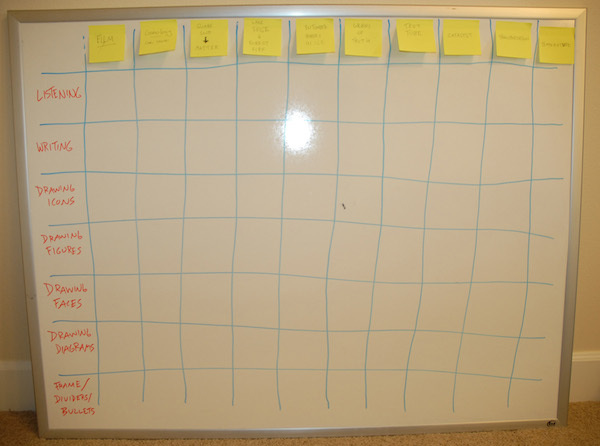 What I’ve realized in the past months is that I wanted to build something bigger than 15 activities. Something more comprehensive and cohesive. Something embedded with my own style and personality. I couldn’t do that with 15 activities. I can with 100. That’s the new number: 100 activities to help you become a proficient sketchnoter. This book won’t improve your skills a little. It will help you make leaps and bounds. I’ve had a blast in the past few months brainstorming what those activities might look like. The most recent brainstorming effort was inspired by Sunni Brown‘s excellent book The Doodle Revolution. In that book Sunni describes the concept of heuristic ideation – all about combining and recombining different ideas to come up with new ones (basically, the idea of systematic conceptual blending). Here’s how I used that concept to come up with a whole new set of activities for The Sketchnote Skill Builder. 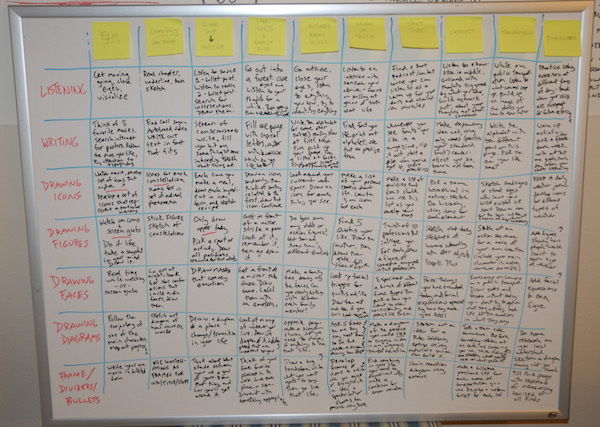 I started by sketching a large grid onto a whiteboard. Down the leftmost column of that grid I listed the general skills that I want the activities within The Sketchnote Skill Builder to address: listening, writing, drawing icons, drawing people, drawing faces, drawing diagrams, and frames/dividers/bullets (something of a catch-all in the last row). For the top row I needed something different – random ideas from any other source. I turned to Radiolab – one of my all-time favorite podcasts. As I listened to the Super Cool episode, I jotted down words that came up during the show: film, cosmology/Carl Sagan, quark soup to matter, lake siege to forest fire, entombed horses in ice (it was kind of an intense show), grains of truth, test tube, catalyst, transportation, and temperature. That leftmost column and topmost row were my starting points. I then filled the grid column by column, using the Radiolab-inspired word to generate activity ideas that focus on the skill addressed in that row. Writing + Carl Sagan = Go watch autotuned videos of Carl Sagan and sketch out some of the text from those videos in a font that fits the content. Drawing Diagrams + Catalyst = Sketch out an idea for a Rube Goldberg Machine using items you own. Then go build it. Drawing Icons + Transportation = Sketch out street signs with laws you wish existed but don’t. Make sure to include an icon within the sign. It took some stretching to fill some of those empty spaces, but I’m genuinely surprised at how well that method of idea generation worked for developing ideas that I never would have thought of any other way. Since I had 7 skills and 10 words from Radiolab, that makes for a total of 70 new ideas generated by this activity. I know I won’t use all of them, but I can already tell that I’ll be using a lot of them. The next step is to add in all of the ideas that came before this activity and pull out the best ones. I might even be at 100 already. More importantly, I can see both my own touch on the activities as well as the benefit they will have on others.